The first time I read the blog “Baseball Cards Come to Life!”, I came to life. 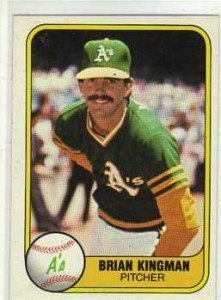 Ever since The Great American Baseball Card Flipping, Trading and Bubble Gum Book in 1973, I’ve been curious about how players feel about their best and worst photos on cards. Q: What’s been your history as a TTM collector (years, specialty, etc.)? A: I actually don’t TTM. I’m a baseball card collector and have gotten a few autographed cards in trades over the years but am not really an autograph collector. I ask questions online (email, facebook, twitter,etc). It doesn’t cost me any postage, and is generally quicker andeasier for the player than a written note. Q: Who was the first former player ever to write you about his cards? How did you refine your questions? A: Pat Ahearne was the first to write back. I’ve kept the questions consistent over the years, occasionally adding something specific, like asking Tim Flannery about his surfboard card. (such as Frank Thomas, the 1950s star)? A: I wasn’t aware of Thomas’s collection. I’d love to trade with a former player (too bad I don’t have any ’52 Topps cards for Thomas)! What other players trade cards? Ryan Tatusko is a pitcher in the Nationals organization who is a big Nolan Ryan collector. We have been working on a trade on and off for a while but he is obviously very busy during the season! There are also some players who are looking for cards of themselves. Dan Smith is one who comes to mind. Q: What percentage of responses are just signatures, versus answers to your card questions? A: As it is online communication, there are no signatures. I would estimate that I have sent over 4000 emails, over 2000 facebook messages, and almost 1000 tweets. I get about a 5% response rate, which I think is pretty good as this is an unsolicited request, and many of the players are surprised to get contacted this way. something I would consider selling. If you or your readers are looking to contact an individual player, I’d be happy to point you to them. My twitter feed is public – you can see all the people I am following there publicly. Lots of current and a surprising number of former players on there. Q: What inspired you to start a blog? How has the blog helped you as a fan and collector? A: My biggest objective with the blog is baseball card trading. Having a blog definitely helps you in the card trading community. Beyond that I wanted to do something different, as there were so many great card blogs out there already. I compiled a few hundred email addresses and started sending emails out, not really expecting to get many responses. I’ve been blown away by how many great responses I have gotten. I think this whole project has helped me as a fan by getting to see more of the human side of players. I see them much more as people then as far-away beings on the TV screen. I find it much more interesting than seeing a signature on a photograph. That said, autograph collectors like you who go way beyond the simple autograph are much more interesting to a fan like me, and clearly to the players too. And I think it is great when you can turn the tables and help them out, like the recent exchange with George Riley. Q: Future goals writing and collecting? A: Just keep doing what I’m doing! I’m going to run out of players to contact eventually, but hopefully my blog will still be relevant! Coming Monday: A special way we can honor Virgil Trucks. Surprise Virgil Trucks On His 95th!